Hello, readers and welcome to today’s edition of the Daily Stock Watch! I’m going to continue talking about cards that are getting some assist from new cards in Ravnica Allegiance today after seeing this hit its all-time high. It has been trending for a while now, and it actually feels like it makes more sense now why because of a new card that looks just like it in the coming set. Are you a fan of taking advantage of strong abilities at a very low cost? If yes, then I wish you’ve already seen this. My colleague Edward Eng talked about this last month as the walking version of Training Grounds so it wouldn’t surprise me to see a deck in Modern that just takes advantage of both. I have seen a couple of ideas running around on how it could look like, and here’s one that I think that people who are interested in the team up could use as their starting point for the deck. The decklist isn’t as polished as you wish it could get but this rough draft should give you an idea of what it’s trying to accomplish. 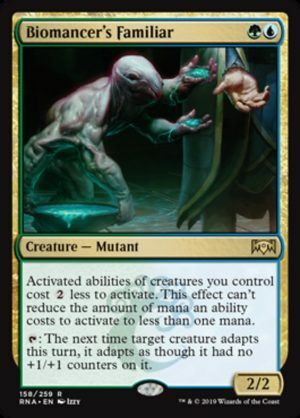 Cheating creature abilities by reducing their costs to almost zero is a huge thing, considering that you could create a platoon of creatures that are humongous enough to beat your opponent during their turn. We’d like to transform this list into something that could finish games in the way that Walking Ballista decks could, but I have yet to figure out how. If you have an idea about something like that, feel free to let us know in the comments section below. Since we’re talking finance here on the Daily Stock Watch, I’d like you to know that Training Grounds just hit $16.17 as of today, having been printed almost a decade back and with no other printings as of writing time. This card used to be one that you would see in bulk bins a few years back and there’s not much competitive notion to support the current trend that says it shouldn’t belong there. I’ve been playing Commander long enough to know that this card isn’t a vital cog to any game-breaking combos that won’t work without it, so should we press the panic button now and start purchasing this card before it goes over $20? There are historically other good cards just like Training Grounds that reduces the costs of either spells or abilities, and produces really good results. Above are just some of those cards that have historically made impacts in their respective formats, and still continues to be great ones up to date. I don’t think that Training Grounds has done enough to be included in this conversation, but it might end up being a part of it if the current hype lives up to its billing. I’m a bit bullish with cards that actually end games just by being there, and this one has the potential to do just that if the correct list is tweaked properly. At its current price tag, I think you could go out there and milk it for what it’s worth. I’d say this one is worth $10 at most unless if breaks the internet with some crazy list that takes full advantage of it and could actually perform consistently with Biomancer’s Familiar. At the moment, StarCityGames is out of stock of this card while Card Kingdom still has two play sets of it at $19.99 each. You could find lightly played copies for as low as $15.42 via TCGPlayer vendors if you’re out there looking for a bargain. Foil copies are just north of $30 and is something that I would recommend getting if you’re thinking of this becoming a real thing rather than speculate on the non-foil ones. In general, I would ask you to stay away from it for spec purposes. Trust your judgment on this one but I’m sticking with the mentality of selling it now.